Golf Tours International Ltd (G.T.I.Ltd) is a family business run by Bill Stinson and sons Robert and Adam. In the Industry since 1998, we pride ourselves on providing a 1st class personal service. Golf Tours International Ltd will take care of all your golfing requirements from International golf holidays to corporate events, leaving you free to relax and enjoy yourself. Golf Tours International Ltd presents a wide range of golf holidays across Spain, Portugal, the UK, Ireland, Turkey and the USA amongst others. We can organise your accommodation, tee times, car hire and coach transfers. We can also book your restaurants as every package is catered towards your requirements. From 1 night breaks to 14 night holidays, the choice of golf holidays is extensive. We understand that arranging a golfing itinerary requires personal attention and that one client’s requirements are different from another. We therefore specialise in preparing “Proposed Itineraries” to meet clients’ specific requirements. Golf Tours International Ltd can arrange your company golf day, as well as any corporate entertainment, including Race Days and Theatre Weekends. Golf trips or corporate events can be accompanied by Bill, Rob or Adam to ensure that everything runs smoothly. Family holidays and Stag and Hen weekends can also be arranged by Golf Tours International Ltd, in the UK or abroad. Why choose Golf Tours International? 1: We aim to ensure that our prices are competitive. There are no greedy margins or unrealistic prices – we want you to have a value for money golfing trip, that you enjoy and want to experience again the following year. 2: We are ABTA bonded so your money is safe when you book with us. 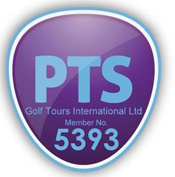 We are also members of IAGTO – the recognised global golf tourism organisation. 3: We understand that sometimes you need to make changes to your itinerary after making a booking, you may want to play a different course, have a later tee time or increase / decrease the numbers on the trip – Golf Tours International Ltd do not charge any administration fees for making these changes. 4: We aim to ensure that the service we offer makes your role as easy as possible. All you need to do is to book the trip, turn up and play golf. Then you can have a drink in the 19th hole, enjoy the local night-life and return home content. 5: Your golf break is being arranged by golfers for golfers. We have stayed in the hotels and played the courses that we recommend and can advise you which ones to play depending on your golfing ability. To take your golf trip a stage further, please do not hesitate to contact us for a tailor made quote and we can prepare a range of itineraries for your consideration. Should the hotel or destination you wish to travel to not be listed on our website, please contact us for details.